Brown the beef over low heat, use a spatula to chop and stir the meat. Then the beef is brown drain the fat. Add the refried beans and use the wooden spoon to mash the whole beans into the mixture to create a smooth texture. Add the salt, chili powder and 2 Tbs of taco sauce to the mixture. Remove from the heat. In another skillet heat ¼ inch of oil until hot. Spread aprox. 2 Tbsp of the beef mixture on the center of each corn tortilla. Fold the tortillas over and press so that the beef filling holds the sides together. Drop each taco into the pan of hot oil and fry on both sides until crispy. 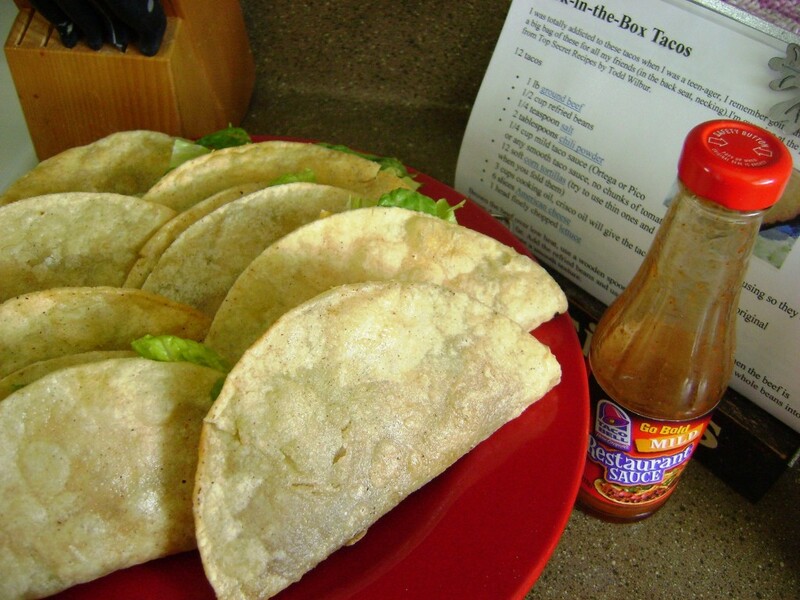 When cooked remove the tacos from the oil and place them on a rack or some paper towels until they cool. Slightly pry open add ½ slice American cheese folded into a triangle and some lettuce. Top with about ½ tsp of the remaining taco sauce.